On July 1, 2005 Mike Repass and I departed St. Georges, Bermuda on Sarah, my Pearson 424 Ketch bound for Flores das Azores. We arrived in Flores at dawn on July 17, 2005. The chart above is a depiction of the route we followed from St. Georges, Bermuda to Flores. The black line is our actual logged track. The red line is the rhumb line route from Bermuda to the Azores. The rhumb line distance is approximately 1686 nm, our logged distance was 1830 nm. The log of this trip has been transferred to an MS Excel workbook that can be downloaded from here. The entire trip took 15 days 11 hours. Of that time we spent approximately 58 hours under engine power, the rest of the time under sail power. The entire first week was spent entirely under sail, with no use of the main engine once we cleared Bermuda. We did run the generator 4 - 6 hours per day to maintain the battery power, run refrigeration and generate hot water. Our maximum 24 hour run was 150 nm, which we achieved on two consecutive days from 1500 on July 6 to 1500 on July 8. We arrived in Flores with approximately 40 gallons of diesel fuel out of the 90 gallons we had on board at departure. We had generally pleasant to spectacular weather for the entire trip. We had a few rain showers pass overhead, but no heavy downpours and no thunderstorms. Most days were sunny with only a few clouds. We had a few days of overcast skies, mostly toward the end of the trip. The highest winds we experienced were around 25 kts, but most winds were in the 10 -15 kt range. Most of the wind was on the beam or slightly ahead or aft of abeam. We did spend the last two days close reaching or beating into light headwinds. We also had one 24 hour period of near calm during which we motored. As you can see we bracketed the rhumb line, sometimes sailing north and sometimes sailing south. We did not attempt to follow the conventional routing of heading north out of Bermuda to around 38ºN - 40ºN then due east until around 33ºW, and then south to the Azores. See Jack Tyler's discussion of the Azores routing options under the Whoosh links on the left for a good explanation of the basis for that traditional routing and the advantages of disregarding it. In our case it would likely have been a serious mistake to have followed that conventional routing. Below is a review of the weather patterns during the first half of the voyage while we were sailing at or south of the rhumb line. On the day of our departure, the weather chart below shows generally SW winds in the area of Bermuda. We headed ENE, just north of the rhumb line on a beam to broad reach in 12 - 15 knots of wind. Those wanting to follow the conventional routing and head north from Bermuda would have the wind more on the stern and with less wind pressure would have been sailing more slowly than if they followed the rhumb line. More important this chart shows the continuing progression of low pressure systems and the associated fronts moving across the Atlantic south of 40ºN. Those who chose to sail near that latitude would have encountered squally weather, although not gale force winds. 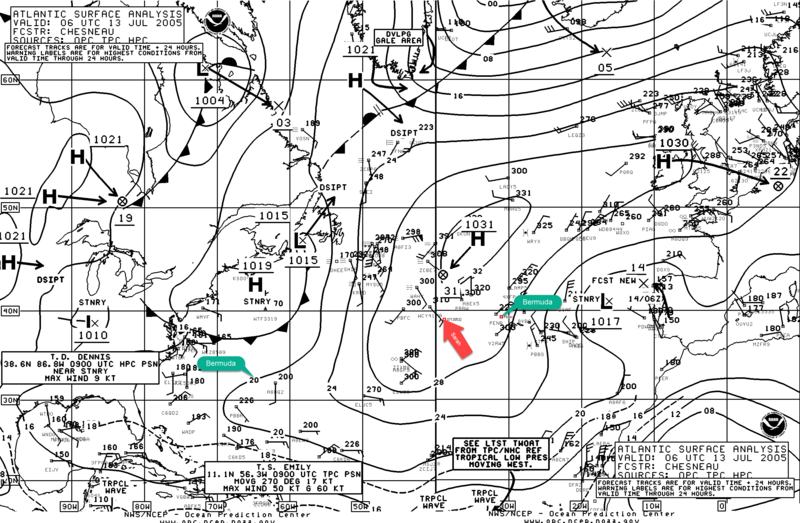 A few days later the low pressure systems continue to move across the ocean near 40ºN. 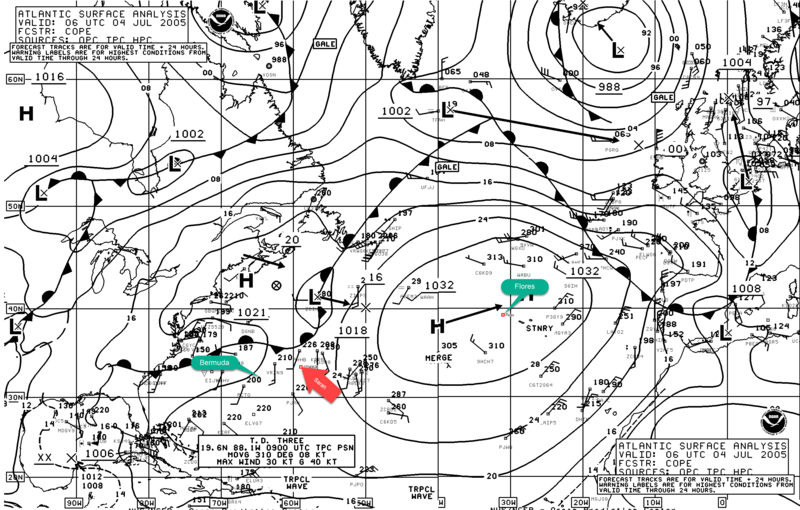 Those boats that departed Bermuda at the same time as we did, but headed due north would be sailing in the vicinity of a weak low pressure system. Not threatening weather, but probably not very pleasant either. Sarah's position is shown by the red arrow. 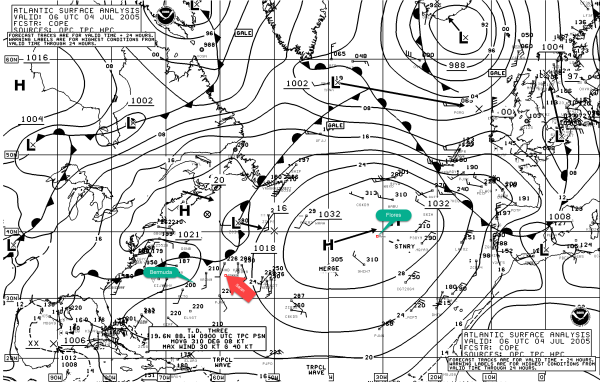 By the 7th of July we were at 49ºW still staying ahead of the frontal system and the low pressure that formed around 40ºN, 58ºW. Now the boats in the vicinity of 40 degrees north were likely encountering heavy rain showers and rough seas, while we were sailing with mostly sunny skies. However this was also the end of our steady beam reaching. From here on the winds were variable and we alternated between motoring and sailing slowly. 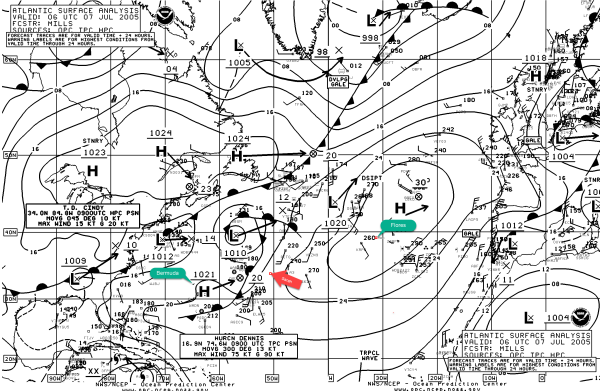 Finally on the 13th of July the fronts and low pressure systems were well north and west of our position and we started to sail north of the rhumb line heading for 40 degrees north in anticipation of NE winds that were expected as high pressure began to build over the entire region. 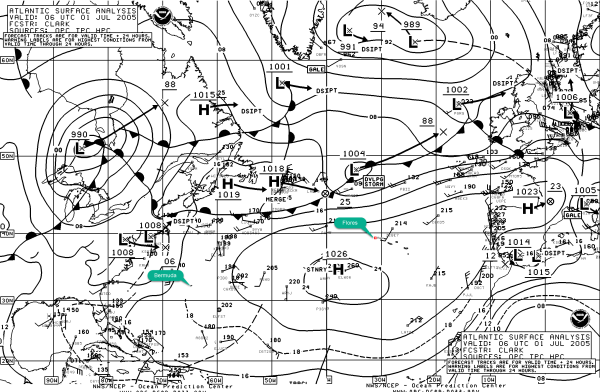 Once we encountered those winds, several days later, we were in a position to sail SE toward the Azores. While it is certainly not conclusive that boats leaving Bermuda at the same time as we who followed the conventional routing would had a slow and rough passage, I cannot believe they would have had as pleasant a voyage as we did. Some folks who left Bermuda a few days after our departure, and followed the same general routing as we, did not have the same pleasant weather and favorable winds as they could not stay ahead of the frontal system. Still I believe they would have been worse off if they had gone straight north out of Bermuda. Of course there are weather patterns for which the conventional routing would be preferred. For example, if the high pressure ridge that existed at the end of our voyage was in place at the start, the rhumb line course would have required sailing hard to windward while favorable winds might have been found closer to 40 degrees north. The overall point is that the conventional routing is only an option, not necessarily the best option. 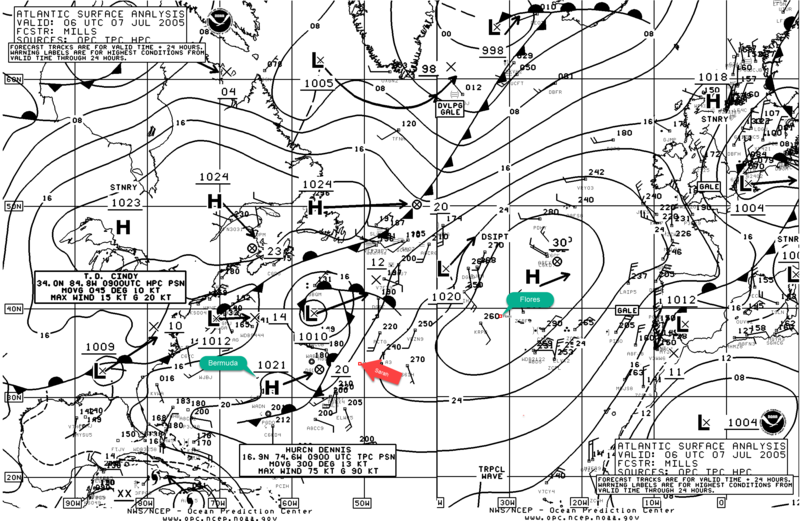 With the availability of up to date weather data and forecasts today's sailor does not need to follow a preset route to the Azores, but can develop a route that is optimized to the existing weather conditions and can modify that route enroute as the weather situation changes. During the day of July 12 the wind died to a calm and we began to motor. Shortly afterward I noticed something on the horizon that looked a lot like a navigation buoy. It was a little off our course, but I was curious and diverted over to take a look. I still don't know what it is, but it definitely is a buoy of some kind. Possibly it is a drift buoy used to record currents and other weather information as it follows the winds and currents around the ocean. We encountered this buoy at 38º6.9'N, 40º8.3'W. Toward the end of the first week our Bahamas fix for the traveler failed. That fix involved epoxying a machine screw into the traveler to hold the control line block in place. There was just not enough surface contact with the adhesive in the traveler to allow this fix to hold. While motoring we decided to try another fix. This time (Fig. 8) I drilled the original hole for the machine screw through the entire body of the traveler (picture top right). This provided about 1" of thread depth for the machine screw. This might have been a great fix, better than the original setup. Unfortunately part of the drilled hole was through stainless steel. When I attempted to tap the hole for a 1/4x20 machine screw I used too much force when the tap reached the SS and the tap broke off in the hole. We were unable to drill the tap out, so we drilled a second hole, slightly closer to the center of the traveler car. This hole was successfully tapped, however it did not provide a flat seat for the control line block, so we had shim the block up with washers (Fig. 9). In addition, the tang on the mainsheet block no longer fit into the bracket on the traveler. So we used two straight tangs to connect the mainsheet block to the traveler car (Fig. 10). We no longer had an elegant solution, but we hoped it would last the remainder of the trip. Looks like I will finally have to replace the entire traveler system after we get to Lisbon.